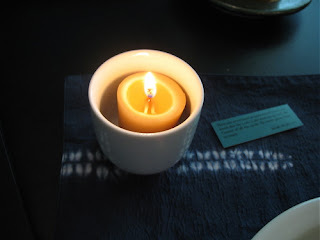 A wild beeswax votive in a tea cup which reminded me to update my order with "the honey lady": votives, tea lights, a short pillar candle, and orange blossom lip balm. Today's "piece of bread": "Have you never heard or understood? Don't you know that the Lord is the everlasting God, the Creator of all the earth? He never grows faint or weary." 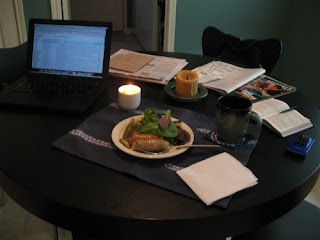 A West Elm tie-dye placemat and coaster, and a paper towel. A beloved Target mug. I'm waiting patiently to order a few more plus the whole set of dishes. Even the tea set. 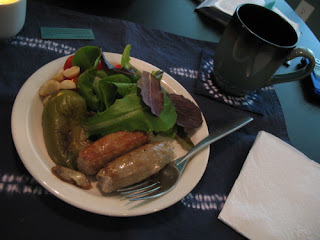 Breakfast: dark roast yerba maté, turkey sausage, a grilled bell pepper, organic baby Romaine greens, grape tomatoes, and macadamia nuts. 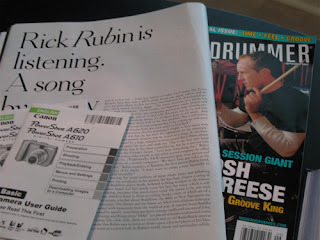 Reading material: a great article about the genius Rick Rubin, digital camera manuals, and Modern Drummer magazine. We're kinda into music in this household. Johnny's backpack slung over a chair (in chocolate). My purse is hiding on another chair. MacBook: checking e-mail and reading a new blog. And looking at her lovely artwork. She also makes these charming dolls - I made a mental note for the future. Heck, I made another futuristic mental note for a little girl's or boy's room (I love "Castle" and "World in Teal"). What good is faith if you don't dream? Last Sunday's (9/09/07) New York Times. I want to read an article on the late, great Luciano Pavarotti today. A brown cardboard envelope holding more simply photo prints. Johnny OK'd ordering a few 2' picture ledges for such prints. That way I can rotate pretty pictures at my leisure. He also OK'd a bird mobile for our bedroom; not now, but in a month or two. My cell phone: I called in a vitamin order. 10% off every Wednesday, we have a $20-off coupon, and Johnny kindly offered to pick up the order. 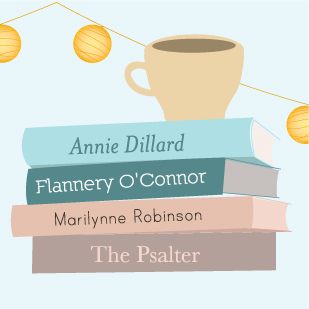 Prayer book open to this morning's Psalms: 62, 63, and 64. On my agenda for today ~ a writing assignment (due tomorrow) [finished on Thursday], hard-boil six eggs, order my aunt's birthday gift, peruse journal web sites to submit an interview [I looked at 1-2], wash our sheets, wash duvet cover, scrub the kitchen sink [done on 9/26], clean my filthy laptop, ask Johnny to place a white teapot on top of a high kitchen cabinet, and read more of The Maytrees. Tonight ~ Talk to my Mom on the phone, make stuffed eggplant with Johnny [cooked on Monday, 9/17], soak red lentils to cook tomorrow, hang wall decor with Johnny's help (for one, a large brown iron Cross in the guest bedroom - $5.50 at a small Texas town gas station) [done Friday], and watch the season finale of Rescue Me. This week ~ try two new yoga DVD's, dust downstairs [finally done on 9/26], clear off coffee table clutter, clean our bathroom [also finally done on 9/26], mail my aunt's birthday card, try a yeast-free peanut butter cookie recipe [baked on Sunday], go on a library date with Johnny, get a new library card [both accomplished on 9/18], and find a floor lamp for the living room and bamboo blinds for the laundry room bath. I know it seems like I've been shopping a lot, but the living room is too dark for reading at night, and the current laundry bath blinds are maroon (previous owners) which does not work with the otherwise neutral color palette. Just part of owning a house. Today's song: "A Wave is Rolling" by The Innocence Mission. Best surprise of the week so far: I ordered a few Aura Cacia mists for our bathrooms and they gave me a free 14 oz. container of Comforting Clove bath salts - I have no idea why! Movies I'm dying to see: The Birdpeople (will try to go, or rent it), The Darjeeling Limited (Wes Anderson! ), The Kite Runner (I loved the book), and Iron Man (I love both Robert Downey Jr. and Gwenyth Paltrow, and my husband has taught me respect for comic books).